One of the best-kept secrets in Virginia, down at the end of the Eastern Shore peninsula, Cape Charles has been laying low since the 1960’s, when the 23-mile Chesapeake Bay Bridge Tunnel opened and all but killed what was left of the once-vibrant town’s ferry- and railroad-based economy. Through a miracle of townfolk determined to hang on to their water-based heritage, a resurgent clam and oyster industry, and some visionary inn and shop owners who keep the post-Victorian architecture alive with hard work and lots of paint scraping, Cape Charles has now passed the “will it or won’t it” tipping point and reclaimed much of its former glory. With a historic downtown area of just 8 blocks by 6 blocks, most people get to the beach or ice cream shop on foot, bike, or golf cart. In summer, the gazebo and lawns of Central Park play host to community parades and festivals, starting this year with off-the-boat steamed crabs at the Crabby Blues Festival in May and wrapping up with Arts Rocks the Inns, when B&Bs open their porches to showcase local artists. Off season, the town quiets down, but excited kids still turn out for Trick or Treat with Pirate Pete at the town harbor, and hardy souls bring in the new year “Cape Charles style” with a crab pot drop at midnight. 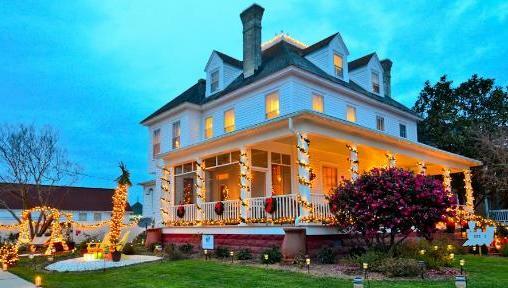 *Bay Haven Inn - 1906 Colonial Revival with 4 rooms (3 ensuite), wraparound porch, garden courtyard. Especially beautiful at night with lights strung through the trees around the yard. Breakfast with locally roasted coffee, snacks and wine in the afternoon. *Fig Street Inn - Built in 1899 as the personal residence for the W.B. Wilson family, owners of Cape Charles’ early hardware and department stores. Meticulous attention to detail in the four ensuite rooms (including one suite), each with either a jetted bathtub or gas fireplace. Sweet treats bar. Quiet location on the outskirts of downtown, but still an easy walk to the beach. *The Shanty – Immensely popular, locally-owned casual bar and seafood restaurant overlooking the town marina (and sunsets). 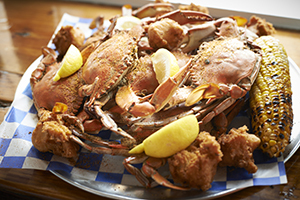 Surprises on the menu await among the fresh local clam and oyster buckets and chowders – try the Caribbean Tacos, Old Bay Chicken Wings, and Pork Belly Burger. Get Wrapped - *Breezes Day Spa on Mason Avenue (the main commercial street) is run by a happy, energized Dutch woman named Marian van Geijn, who clearly practices what she preaches. Marian and her team offer everything you’d expect, times ten (and the TripAdvisor reviews to prove it). Massage, facial, body treatments, mani/pedi, even a spray tan if you run out of time to hit the beach. Adorn Yourself - Owned by entrepreneur and creative force Meredith Restein, *Moonrise Jewelry produces wearable art, handcrafted locally from eco-friendly materials, including her striking Reel Fish Leather cuffs and Real Orchid necklaces. Take Off - Eastern Shore Golf Carts rents zippy little carts by the hour, day or week. Get Provisioned - Gull Hummock Gourmet Market is chock full of treats, and offers free wine tastings on Fridays from 4:30 to 6:30 and Saturdays from 2 to 6. Hit the Water – SouthEast Expeditions’ Paddle Your Glass Off kayak excursion to Chatham Vineyards lets you check off your daily exercise requirement while tasting wine – genius! - or let the guide pick a route. SouthEast Expeditions has offices in Cape Charles, Chincoteague, and Onancock. Go Fishing – Wachapreague, about half way up the peninsula, bills itself as the Flounder Capital of the World, and Top Dog Charters in Cape Charles is happy to help you get in on that. Tee Off – Next door to Cape Charles, Bay Creek Resort can boast that they are the first club to offer courses designed by both Arnold Palmer and Jack Nicklaus. The resort has been ranked among the top 50 golf resorts in the country. Chatham Vineyards - 25 minutes north of Cape Charles. Jon and Mills Wehner have been making high quality wine in Virginia for decades. Try the steel Chardonnay, which has become the winery’s signature. Bloxom Winery – 1 hour north of Cape Charles. Open only on Saturdays, from 12 – 7, Bloxom’s front deck is bordered by a boisterous garden of lavender and other lovely plants. Owner Robert mans the wine tasting bar while co-owner/wife Francesca handles the pizza oven. *Blue Crab Bay Co – 40 minutes north. A true local success story, founder Pamela Barefoot first set up shop in her farmhouse kitchen in Onancock. 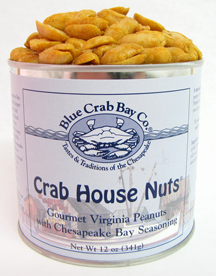 Blue Crab Bay Co products now dominate gift and gourmet shop shelf space around the country. Visit the Blue Crab Bay shop in Melfa and you can say you got your Barnacles, Crab House Nuts, and Sting Ray Bloody Mary mix from the source. 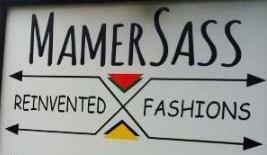 *MamerSass – 75 minutes north, in Chincoteague, MamerSass owner Jamey Brittingham “reinvents” clothing, creating funky fashions and opening a new channel for the sustainability movement.